A martial arts master is murdered by a rival clan that also happens to smuggle heroin. The slain master's top three students take revenge on the clan. 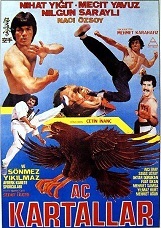 Stars Nihat Yigit (aka: The Turkish Bruce Lee). (In Turkish language, with English subtitles).